A complete cycle of sales process includes many factors like quantity and volume of the product, sales price, commission, trade discount, sales agents, etc. To furnish a target for sales is not an easy task to perform as it demands a lot of research and analyzing power. 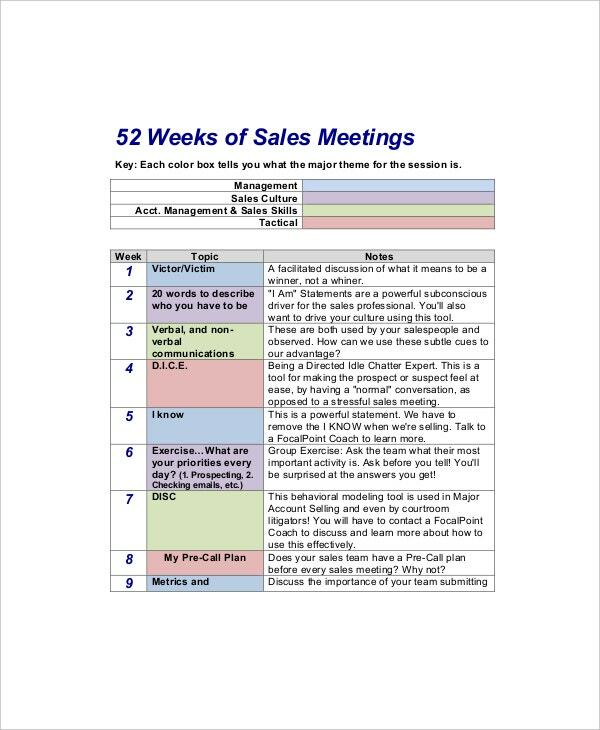 A sales meeting agenda covers all these aspects to perform an effective meeting for reaching an ultimate decision for the sale of the particular product. You can also see School Agenda Templates. 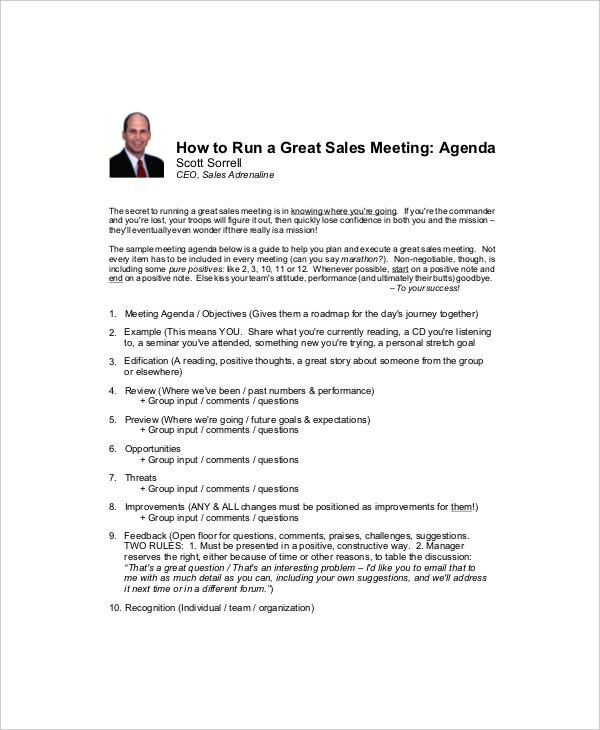 An effective sales meeting agenda template is drafted to create a friendly scenario in the meeting along with the call of a notice. 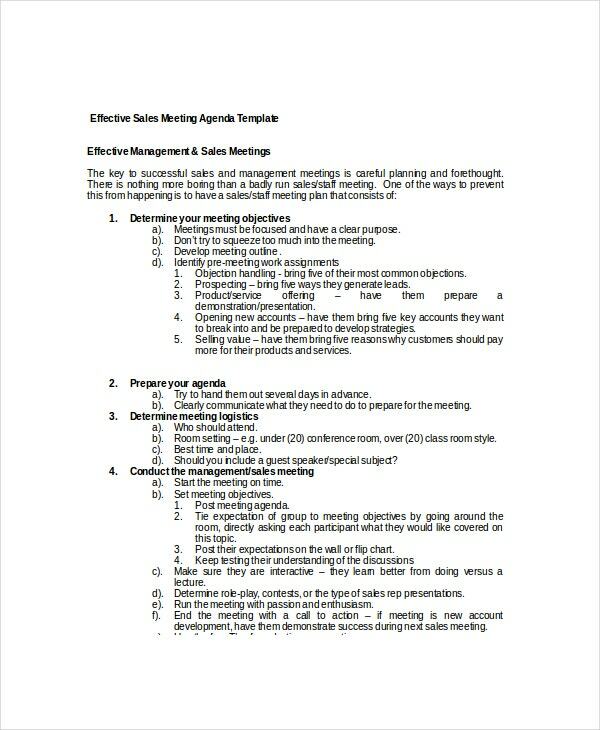 Moreover, to achieve the desired sales target, an effective sales meeting agenda template plays a crucial role as it features the sales department to work efficiently in the stipulated time. Everyone knows that the marketing is an essential part to achieve the effective sales, so, a marketing sales meeting agenda should contemplate all essential points pertaining to sales. 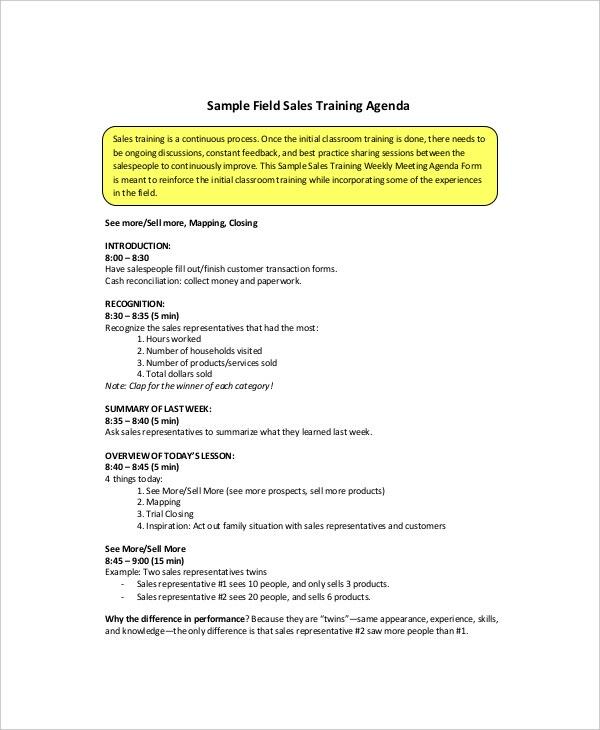 To sustain the existing growth in sales and to face the current competition, the marketing sales meeting agenda template covers the specific market area to discuss the sales policy. You can also see Agenda Templates. 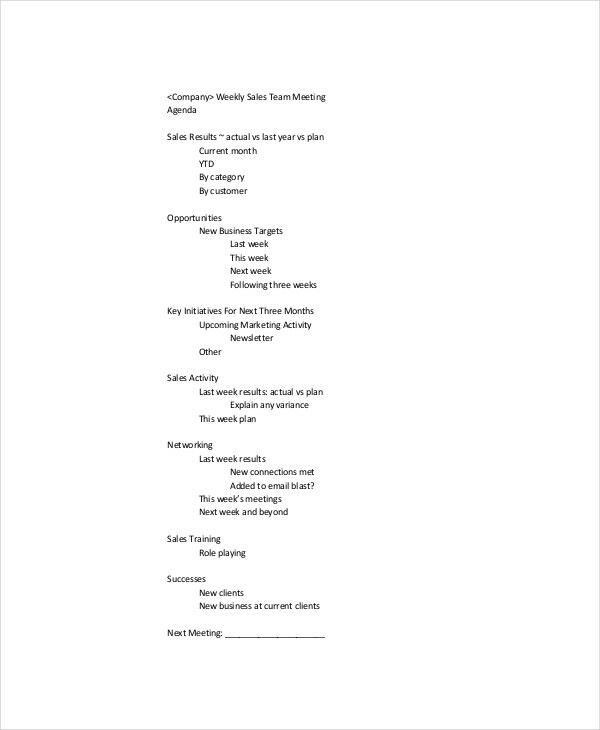 In a business, to maintain the essential sales growth and decide a perfect sales policy to achieve the desired sales target, the meeting agenda template should contain the information and data pertaining to sales targets so that the respective members can discuss on the same and reach the certain conclusion. 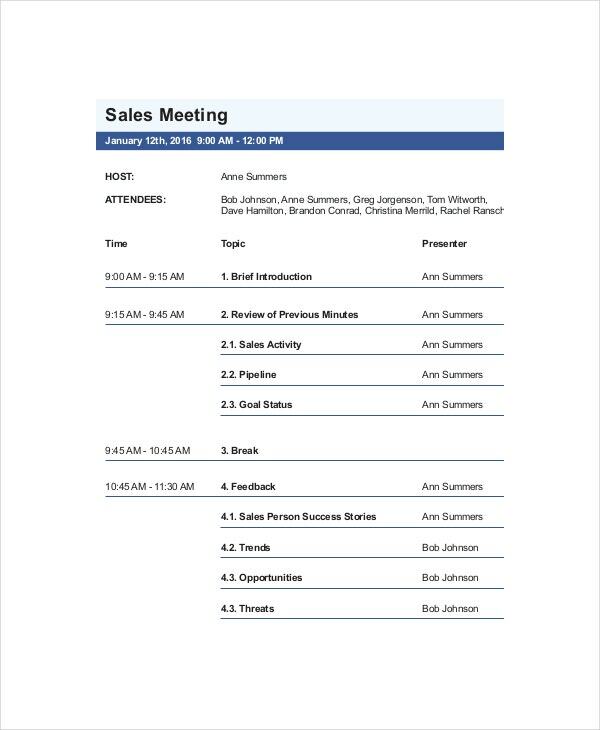 A basic sales meeting agenda template works as a role model for various kinds of sales meeting agenda template and provides a base to plan and perform any complex sales meeting agenda template. It also includes a coverage point to write down the summary of the minutes of the previous meeting. To obtain the desired target and avoid the effect of the potential fixed cost, the greater sales volume is needed. 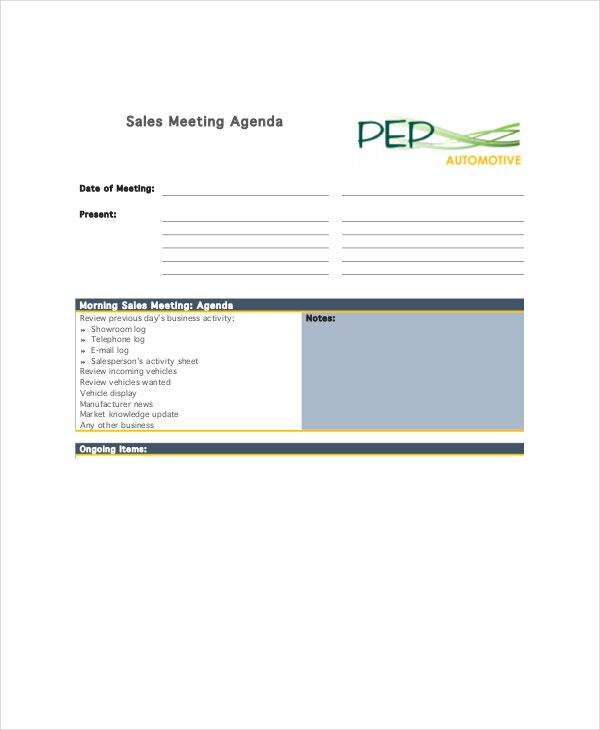 A weekly sales meeting agenda template cover a weekly plan to discuss in the meeting with the respective department and staff members. 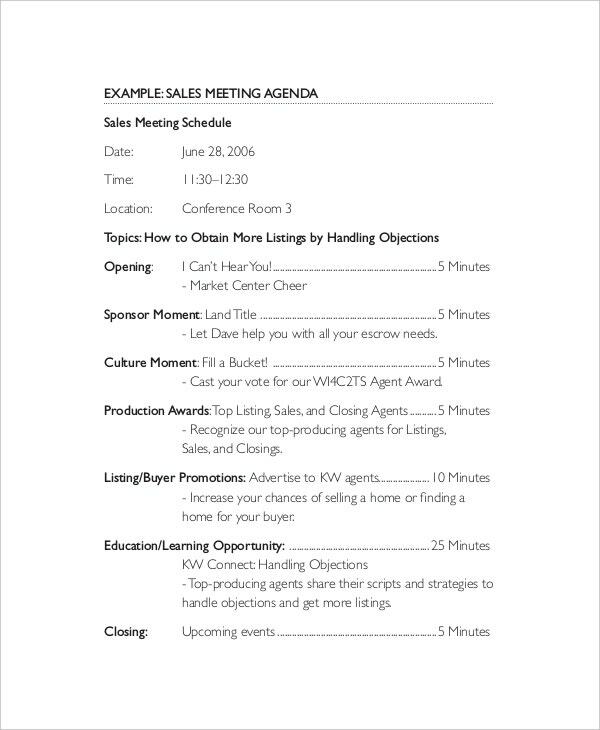 > What Does Sales’ Meeting Agenda Template Stand for? 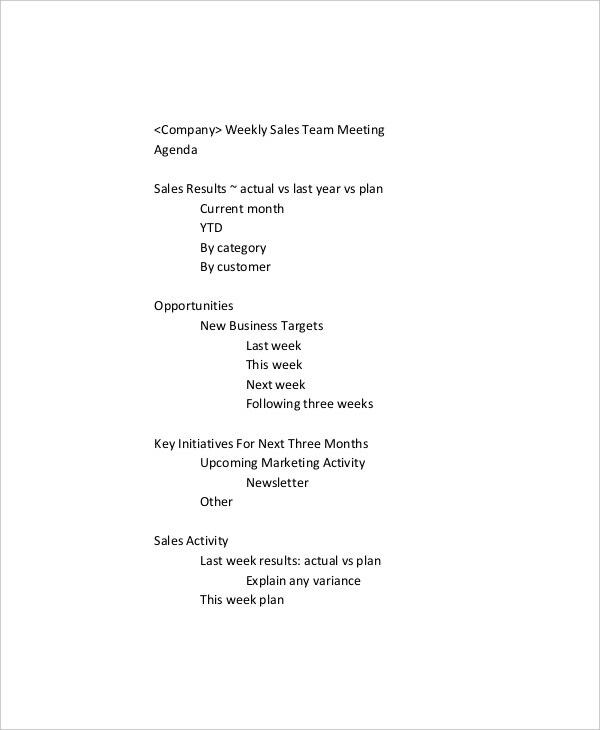 A sales meeting agenda template is a management mechanism to control the meeting and forces to focus on the specific points that are necessary to discuss. It gives an umbrella under which the discussion is created on certain sales specific topics to increase the sale volume as well as the worth of the company. You can also see Blank Meeting Agenda Templates. It should contain all essential features by categorizing and prioritizing the same. The form should be set in a systematic format for the better understanding. 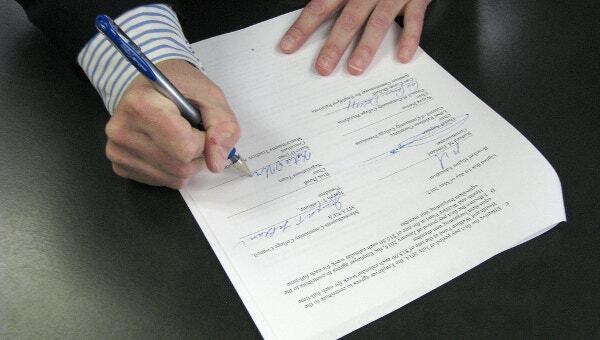 The template should be signed by the circulator or the person who is organizing the meeting. A clear and well-mentioned agenda should be present in the template designs. The gist of the summary sales records and corresponding data should be gathered in one place. To achieve the target of the effective sales and high margin. To keep the meeting duration short and improve the interest of the members. 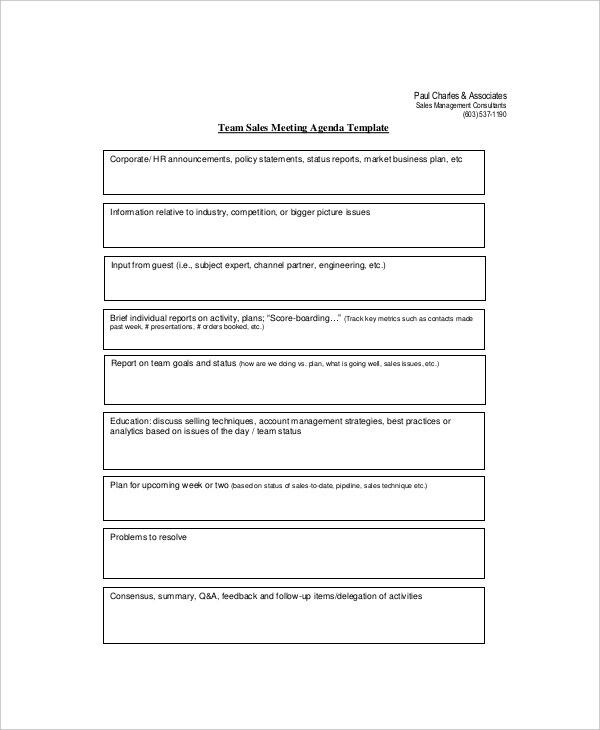 For the optimum utilization of the resources and get the better performance of the company through the means of sales meeting agenda template planning. 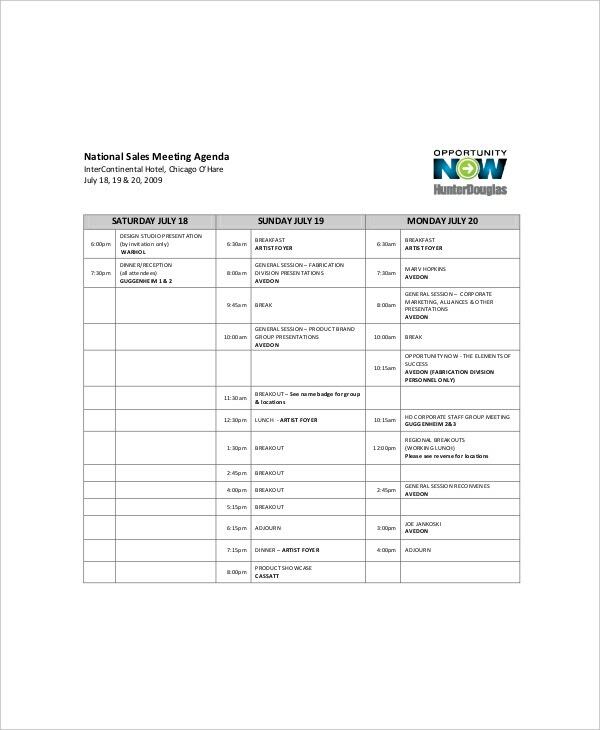 Get a wide range of sales meeting agenda template with the quality statements and clauses to incorporate the sufficient data, with us, to work in a flawless manner and effective meeting. The format is simply available in the word format and also in the image form to download. Having the best compatibility feature, one can get the easy printout of the same and fill the blank points. You can also see Agenda Planner Templates.